In today's competitive markets, having a product or a service that is valuable to a wide customer base is only the first step toward creating and sustaining a profitable company. Appropriate and targeted marketing of that product is, if anything, more important than the product itself. Success in marketing is primarily a matter of reaching the right audiences. Although it's tempting in our digital age to rely heavily on the internet and social media to reach out to new audiences, this would be a mistake. Heading to trade shows may sound old-fashioned to those who are not in the know. Industry insiders, though, often rely on these types of events to generate new leads, network with other professionals, and address their company's message and brand to a targeted audience. Those who are new to this somewhat complicated world may initially find it all a little bit overwhelming, but with just a little bit of research, you'll find that an investment made in a trade show booth is money well-spent. Read on to find out how to best ensure that information about your company is reaching the right people. Think about who already uses your company's services. Does the service target individuals or companies? If your company sells a product directly to consumers, understanding demographics is key. You'll want to look at any information available regarding existing clients' levels of employment and education, ages, locations, incomes, interests, and any other information you can find. This will help determine where time and money on marketing are best spent. If your services are more likely to be used by companies rather than individuals, try to find information about company size and purchasing power. It also helps to keep in mind that, even if a product or service is being marketed toward companies, individual employees are often still responsible for making a decision in regards to how the company's money is being spent. Knowing your audience and what appeals to them will be a great help when it comes to ensuring you are reaching your intended client base. If you already have a specific trade show in mind, think about who is likely to attend. You can often find information regarding the show's expected audience and participation online on its website. When this information is unavailable, you'll have to directly contact the staff of the show themselves. Once you've got an idea of what kind of attendance the trade show's organizers are expecting, you can decide whether or not your target audience is likely to attend. Ask yourself whether your product is better marketed at a B2B, or business to business, show or a B2C, or business to consumer show. If, to take one very specific example, you are attempting to market a service that helps small companies streamline their networking capabilities, it is unlikely you will find money spent on B2C trade show booths well-spent. Actively networking with other businesses at a B2B show will, however, be much more likely to yield positive results. Deciding which trade shows are most likely to get you in contact with future clients and customers is still only the second step toward effective marketing. Without a skilled and dedicated marketing and sales team, you will not be able to make the kind of splash necessary to attract attention. Remember, first impressions are key. At industry trade shows, in particular, there are likely to be many other companies and individuals marketing similar services and products, so yours has to stand out. Develop a comprehensive marketing and sales strategy before going to your first show. This strategy will necessarily be based on the needs of your target audience and the expected turn-out of the show itself. For example, if you work in the tech industry you can probably expect to be dealing with a younger clientele. Those with less industry, and specifically less trade show, experience may be more likely to be drawn in by flashy displays and bold lighting than insiders who have been attending shows for years. Keep this in mind when you are making important design decisions about the booth itself and also when training your sales team. It cuts out some extra work and hassle if your target audience comes to you once you've got your booth set up, but this often is not the case. Be sure every member of your sales team is 100% clear on the audience profile and knows who to spend their time talking to and convincing. 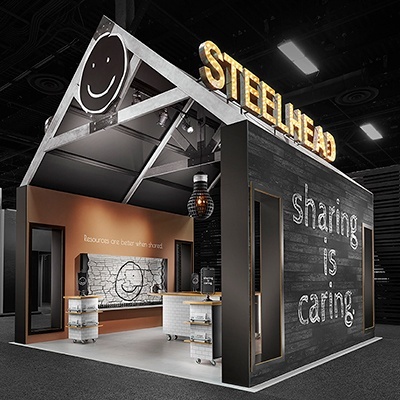 If your goal is to network with other companies or to net high-profile clients, the design of your booth should reflect that. Small, private conference areas and product demonstrations targeted to individuals who are on the fence can make a huge difference. This is particularly important when you are attempting to make a sale to a new company. Having some idea of what level of employment and importance within their companies the individual people your sales team are addressing might hold can certainly help in determining who to spend more time and dedicated personal attention on. When it comes to B2C shows, this targeted approach can still go a long way. Sales staff should try to gauge interest and target individuals who are on the fence with a more one-on-one and personalized approach. Renting or buying a booth at a trade show is a serious monetary and time commitment, so be sure you are prepared to make the most of it. Don't go in blind. Plan at least one sales meeting specifically to discuss your target audience and how to reach them, and make sure all personnel are on the same page prior to setting up at an event.